Gain an understanding of the symbolism and the meaning of signs and symbols used by Native American Indians and their uses of writing in symbols. An ideal and fun way to learn about Native American Indians by writing in symbols. Kids and children will enjoy undertaking activities related to writing in symbols. The use of pictures, signs and motifs were put to good use by Native American Indians when writing in symbols. Pictograms using symbols conveyed their ideas in basic pictures of visible objects on various forms such as on their war paint, weapons, the bark of trees and the skins of animals with which they made their clothes and tepees. The content of this website is filled with authentic images and pictures of men and women from various tribes. Every picture really does tell a story. The symbols on their war paint and the pictures and signs that decorated their homes hold secret messages - for those that can read them. Creating a pictogram is a form of writing in symbols that uses drawings to tell a story. Kids and children will enjoy creating stories by writing in symbols. All the kids need are some basic pictures to work with and some creative ideas and activities. Many elements of a pictogram are elemental, basic and logical and provide the means to convey a story and ideas by writing in symbols without the need to use the correct spelling, grammar and punctuation. Writing in symbols therefore provides kids and children with freedom of expression enabling them to use their imagination to create stories without the normal limitations. Because they are so visual children and kids can emulate the concept and language of a pictogram to tell their own stories by writing in symbols. The meanings of signs and the types of symbols used by Native American Indians are fully illustrated and can be accessed via the Picture Dictionary of Symbols. The symbols dictionary provides information and the origin of many symbols and include references to Native American legends and the mythology of the ancient Mound Builders and the fantastic creatures and monsters that feature in their culture. 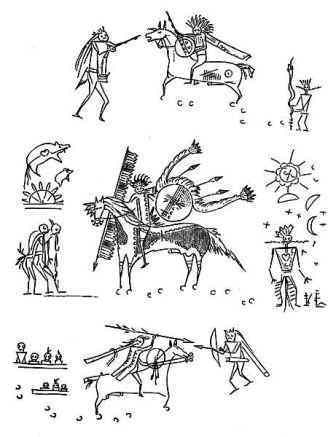 The worksheets contain many authentic pictures by Native American Indians including many animals which are not shown in the dictionary but are highly suited to activities relating to writing in symbols. The worksheets for writing with pictures contain a variety of different signs, motifs and symbols can be accessed via the above links. Have fun Writing in Symbols! Writing in Symbols with Worksheets and activities. Discover the vast selection of pictures which relate to the History of Native Americans and illustrate many decorations and symbols used by American Indians. The pictures show the clothing, war paint, weapons and decorations of various Native Indian tribes that can be used as a really useful educational history resource for kids and children of all ages and a means to study the interpretation of symbols and writing in symbols. We have included pictures to accompany the main topic of this section - Writing in Symbols. The videos enable fast access to the images, paintings and pictures together with information and many historical facts. All of the articles, such as the Writing in Symbols, can be accessed via the Native Indian Tribes Index. Have fun writing with symbols!